Scotland manager Gordon Strachan took heart from how a new-look side adjusted to an early onslaught to earn a welcome friendly win over the Czech Republic. Ikechi Anya's early goal was decisive, but keeper Allan McGregor kept the hosts at bay with several fine saves. "McGregor was fantastic, he made a couple of great saves. 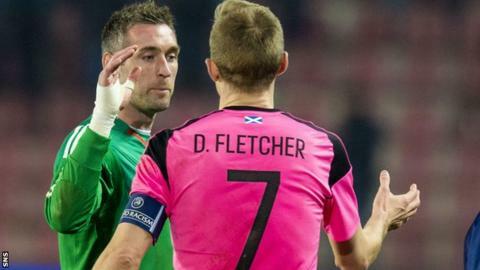 I wish he didn't have so much to do," Strachan said. "We didn't actually close people down but once we sorted that out and passed it better, it became a different game." Strachan gave Aberdeen midfielder Kenny McLean a debut from the start, while on-loan Blackburn striker Tony Watt and Birmingham right-back Paul Caddis also won first caps as late substitutes. Ross McCormack, back for the first time in two years and only a late call-up after an injury to Steven Naismith, set up Anya's goal and held the ball up well, while Robert Snodgrass impressed on his return after missing the entire Euro 2016 qualifying campaign through injury. But Strachan was keen to stress his satisfaction with the collective response rather than individuals. "It was maybe a bit of a gamble having two squads, but it means you can see more players, how they play, and how they work within the group," he said. "That is the bonus. "There are a lot of players that weren't here who would expect to start, but the group have made it a good night. There are a lot of guys who have done themselves proud, especially in the second half. "We are not a great side but we can turn ourselves into a decent side by working hard. It was great learning from the first half to the second half about how small things can change a game." Of the players who featured in Prague, only Anya and Charlie Mulgrew are also in a different 19-man squad for Tuesday's friendly against Denmark. Gordon Greer, an unused substitute in Prague, is also in the party to face the Danes, while Steven Whittaker - who withdrew from the Czech game with his wife due to give birth - and Steven Fletcher, who was suffering with a virus, are also in the squad.